This is a follow-up to an earlier diary about the threat posed by oil spilled by a freighter that broke up off Nightingale Island, home to approximately half of the world's endangered Northern Rockhopper penguin population. Here is a brief recap of key events. On March 16, for reasons no one has been able to determine, a fully loaded freighter containing soybeans slammed into the rocks off Nightingale Island in the Tristan da Cunha archipelago (a World Heritage site) in the south Atlantic. The freighter broke in half and sank, dumping at least 1500 tons of fuel oil in the seas, which formed a heavy oil slick around the island, threatening marine life. The penguins attracted the most attention as they are a critically endangered. Because of the remote location, it took wildlife rescue teams nearly a week to reach the island by boat and set up operations. Wildlife biologists estimate that half of the 20,000 penguin colony have had some exposure to the oil and over 300 oiled penguins have already died. "Unlike previous spills of this size, it didn't happen way out to sea and gradually approach such a vital conservation area. It struck right at the heart of the penguin colony and it's devastating to them." Thanks to outreach and updates by marine biologist David Guggenheim, the difficult wildlife rescue operation is starting to get broader attention by NGOs and the media. CNN has finally covered the story. The Sovereign State of BP - Down for the Count? British Petroleum has operated as though it were a sovereign state since its inception. When they blew the well at their Macondo Prospect in the Gulf of Mexico, it never occurred to them that they would have to take orders from anybody. But that may change largely due to their inability to stop the flow of oil after nearly sixty days of gushing. President Obama was clear in his speech last night. If any entity is going down as a result of the catastrophe, it will be BP. Today, Obama meets with BP's Chairman of the Board, Carl-Henric Svanberg, and the man he told the chairman to fire, Chief Executive Officer Tony Hayward. Two sovereign states will collide. The outcome is a foregone conclusion. 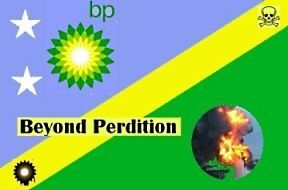 Read more about The Sovereign State of BP - Down for the Count? The Coast Guard said late Wednesday that a new leak has been found at the site where an oil rig exploded and sank in the Gulf of Mexico. 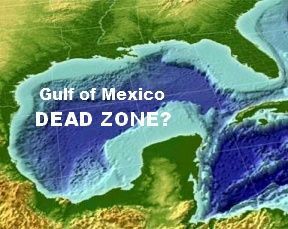 Rear Adm. Mary Landry says that 5,000 barrels a day are now estimated to be leaking, meaning 210,000 gallons are spilling into the gulf. Officials had been saying for days that it was 42,000 gallons. At 10.8 million gallons for the Exxon Valdez spill, it would have taken 252 days for this deepwater spill at 42,000 gallons per day to match the worst human caused oil spill in history. However at 210,000 gallons, this record could well be met within 42 days. We're in the home stretch for the legal proceedings against the largest environmental disaster of this new century. Some tribal people in the Ecuadorian Amazon have got a strong case against the giant Chevron Corporation of the Estados Unidos for damages of up to 27 billion dollars. Hold this image. Some barefoot indigenous folks who never drove a car, who haven't even seen many cars, are being led by a heroic Ecuadorian lawyer in the case of his life, hell, in the case of Big Oil's life and all of the trans-national oil companies' lives. Because later this year, when the mallet comes down, natural life for the planet - Pachamama, as empowered by the Ecuadorian constitution - will have stepped from the shadows to take her place alongside humanity, and humanity itself down to the most anonymous forager in the steaming jungle will have finally won out over the greed, arrogance and power of some of the planet's most abusive corporate elites. Here's a link to a dailykos diary I posted yesterday, concerning the Chevron oil spill trial in Ecuador, highlighting the note that CBS's 60 Minutes was running a segment on it. It aired last night (Sunday, May 3). That video clip is in the diary. "SAN FRANCISCO - Most of the oil that spilled into San Francisco Bay when a container ship struck the Bay Bridge will never be retrieved and eventually will be absorbed into the ecosystem, authorities said Friday."